Organizing your home isn’t just about picking up the clutter, and naming a sock drawer. If you really want to benefit from an organized space, creating a plan is in order. If you ask yourself a few simple questions, you can get some inspiration for tackling this organization step by step, and space by space. Here are a couple of guidelines on how to make the best use of every space. Take a look around each space, and try to determine if there are changes you could make that would create a more organized space. 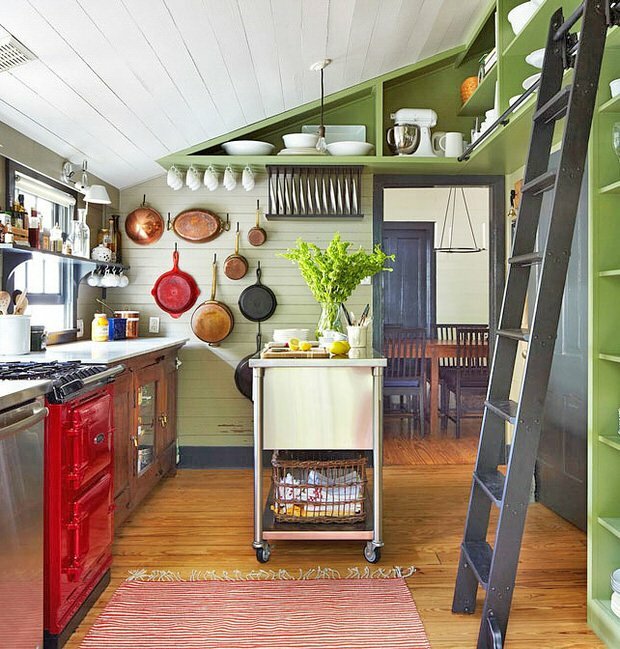 Is there overhead space that could be corralled in the kitchen, so that you can keep those three full sets of dinnerware you love? This photo below from Alex Hemer shows the potential in even the smallest kitchen. Want to make sure your guest bath feels like a luxury hotel with all the amenities, but can’t figure out where to put it all? 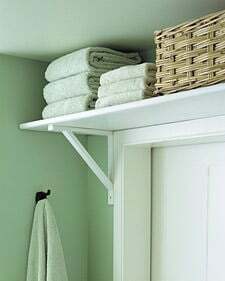 Another easy way to find storage when organizing your home- above a door. From ‘Martha‘. What do you need in your home, for you and your loved ones? Maybe you don’t care about a changing table in the baby’s room, but you want to make sure those books are always accessible. Look up, around, and through! (Through things like closets, which happen to offer a lot of options!) Photo by ‘Finnian’s Moon Interiors‘. We all feel like we “should” organize our home… and yes, we should! But don’t do it just for the sake of doing it. Does moving all the Costco purchases to the upstairs closet make sense? Or will the kids wake up the household on Saturday night looking for the popcorn stash? 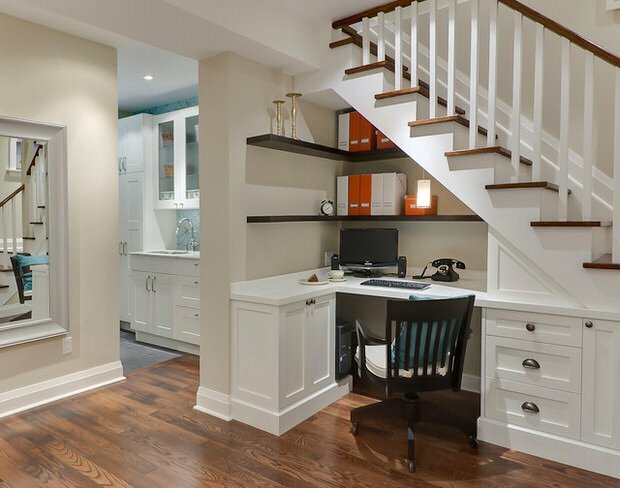 This under stair office would work really well in many households… unless you have kids tearing through that space every hour of every day. Photo from ‘Houzz‘. Ok, we all know we cook in the kitchen, get ready in the bathroom and sleep in the bedroom. But do you have designated space for all the the individual things that have to be put away? I drink a lot of tea, so I have a tea drawer. When I buy a new box of herbal joy, it always goes from the grocery bag to my tea drawer. Figure out what items you trip over the most, and designate an organization spot for them. Here are some ideas for developing more designated space, in a small space! This staircase storage unit was created by ‘Danny Kuo‘. This would be great for a laundry room! 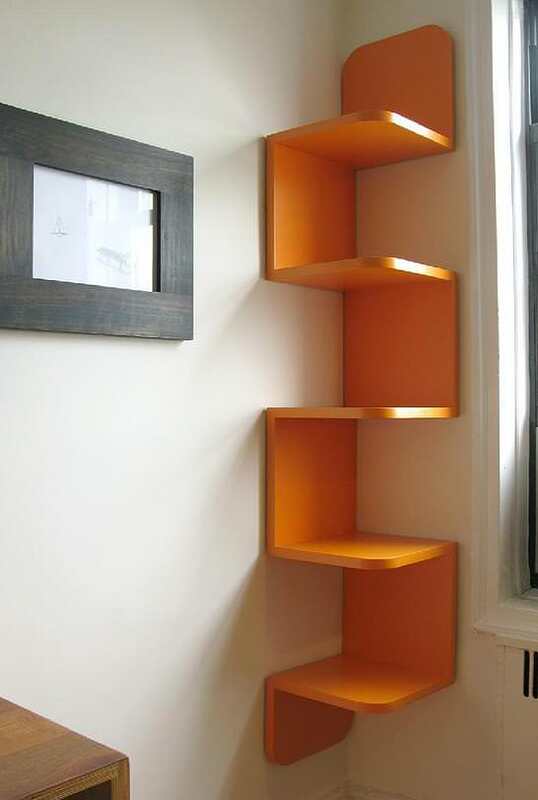 We love the way this corner shelf from ‘Willam Finney Studio‘ takes advantage of those tight spaces… Organizing your home doesn’t always have to mean cupboards and closets! 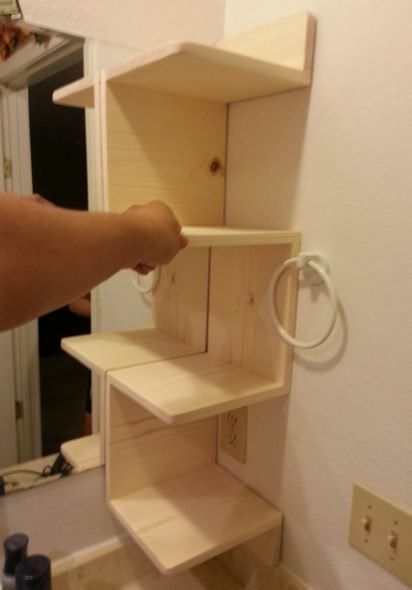 We liked it so much, we found these DIY knock off corner shelf instructions on ‘Instructables‘! Organizing your home is sometimes as easy as making the best use of the space you already have! We think you will also love out posts on Organizing Kitchen Drawer Ideas & Projects, and DIY Stair Railing Projects! Next Post Accent Ceilings are the New Accent Walls! How do you reach the books in the high shelves under the stairs?? A library ladder would do it! Wow I had only looked at some of the Christmas projects. But there is so much more. Thank you again! I love a lot of the ideas and a lot of the ideas I can do with my daughter who is 12 for homeschooling. 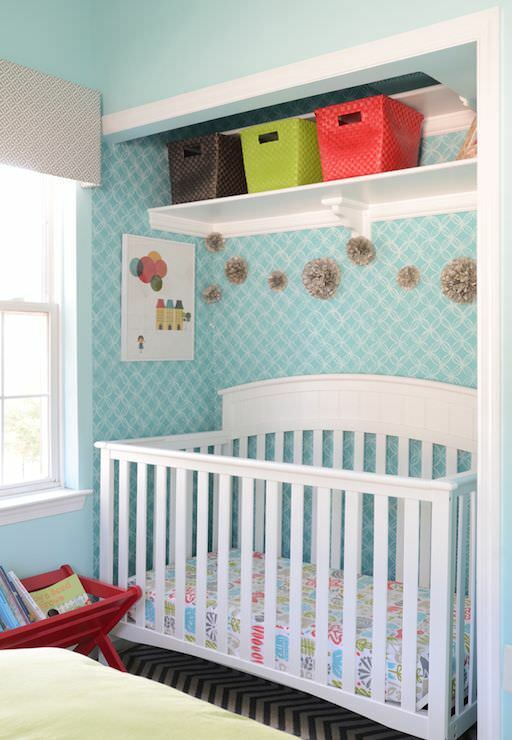 very interesting ideas – loved the bookcase under the stairs and ditto the home office, but very definitely would not have a shelf over a baby’s cot for fear of something falling on the kid! good pics and i’m inspired to sort my hallway out once and for all!